AUGUSTA — It takes more than a carefully carved turkey and an old folding card table when hosting Thanksgiving dinner means feeding as many as 600 people. It takes volunteers. Food, and lots of it. And people with the skills, equipment and kitchens needed to super-size a traditional family Thanksgiving dinner to feed anyone in the community who turns up looking for a hot meal. Transportation available from Green Street United Methodist Church to The Red Barn, leaving 11:45 a.m.-3:45 p.m.
To donate: Mail to Green Street United Methodist Church, 13 Green St., Augusta, 04330, with payments marked Community Thanksgiving Dinner. Alicia Barnes, business manager of The Red Barn restaurant in Augusta, is thankful she has found plenty of all that, including about 90 volunteers to help as the restaurant plays host to its first free community Thanksgiving dinner. The meal will be put on in partnership with restaurants, the church that has hosted a free dinner for the last 30 or so Thanksgivings, and others. The free community dinner is Thursday from noon to 4 p.m. at The Red Barn at 455 Riverside Drive. Organizers are splitting the volunteers into six shifts at two hours apiece. Anyone from the Augusta area is welcome, though Barnes said the meal is primarily intended for people who wouldn’t be able to provide a Thanksgiving dinner for themselves or their families. 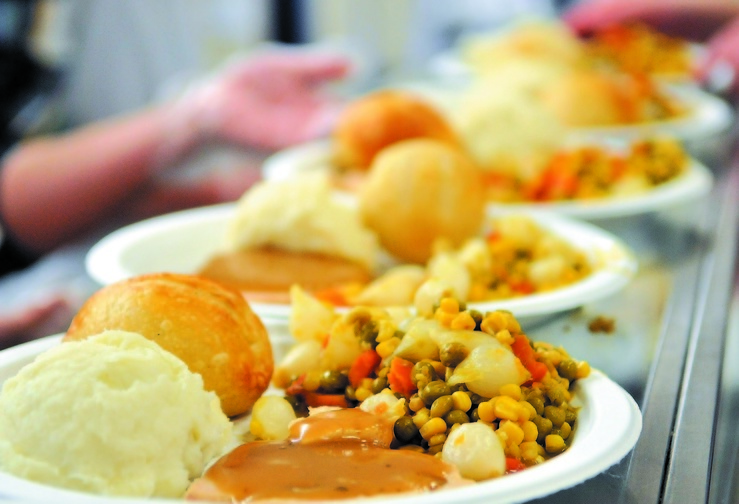 For the last three decades or so, those in need of a good free meal on Thanksgiving in Augusta could find one at Green Street United Methodist Church. This year, however, church leaders decided to partner with The Red Barn and others who have joined the effort to put the dinner on together. The Rev. Thom Blackstone said church volunteers who put on the dinner each year were already thinking about making changes to the event because their ability to handle the growing numbers of people attending the dinner was reaching capacity. “We got talking about it (with The Red Barn) and decided, rather than two smaller meals, why not combine forces and try to do a bigger thing?” Blackstone said. Volunteers from the church will still be involved in the dinner, making dozens of pies, and the church is providing about $900 it had budgeted to pay for hosting the dinner to instead help pay for the new dinner at The Red Barn. The church, a nonprofit organization, is also accepting donations for the event. Blackstone said any money donated but not spent on this year’s dinner will be saved for next Thanksgiving. He hopes the meal will fill a need not just for people who can’t afford their own Thanksgiving dinner, but also people who would otherwise be alone for the holiday. “It’s not just providing a meal, it’s giving a sense of belonging to people who may feel a little left out in the cold this time of year,” Blackstone said. Partners include the China Dine-ah, which will provide 15 turkeys and some kitchen equipment; Rebecca’s Place Restaurant, where workers will peel, cut and cook about 250 pounds of potatoes; Downtown Diner, which will provide pies; Coca-Cola, which will provide cold beverages; and J.S. McCarthy Printers, which printed up about 100 posters for the event. Also helping out are the city of Augusta and University of Maine at Augusta, which are providing two shuttle buses to take people from Green Street United Methodist Church, which is near downtown Augusta, to the dinner at The Red Barn. “A lot of the people who went to the dinner at Green Street live within walking distance of it, they live downtown,” Barnes said. The church is going to be open, and provide coffee and muffins on Thanksgiving during the dinner, to provide a warm place to catch the shuttle buses. The buses will leave the church between 11:45 a.m. and 3:45 p.m.
Barnes is estimating they could get between 500 and 600 diners, and she hopes they don’t all show up at the same time. She said some Red Barn staff who volunteered to help will be in the kitchen and they are already experienced in pushing food out quickly. The food will already be cooked and hot, and will be served on plates which can be used to eat at the restaurant or can be taken to go. Barnes they expect to be able to feed people fast enough to have them in and out quickly, so they’ll be able to accommodate everyone. Buses from Green Street could be held, briefly, if there’s no space for more diners at the Red Barn. Barnes said having the dinner at The Red Barn sprung from posts on the restaurant’s active Facebook page in response to an inquiry the restaurant posted asking people what it should give away in its next contest. Someone suggested putting on a free community dinner. Barnes ran the idea by Red Barn owner Laura Benedict, who agreed to have the restaurant to host the holiday meal. The Red Barn already hosts regular fundraising dinners for numerous local organizations, but Barnes said she and others at the business were initially intimidated by the size of the dinner. With the help of other volunteers and businesses, though, they will meet the challenge and make the dinner a success, Barnes said. Barnes said that some volunteers are bringing their kids to help. “That’s what we’re all about at Red Barn — community,” Barnes said. Teams of volunteer drivers will also deliver Thanksgiving meals, which include turkey, potatoes, squash, peas, rolls, gravy, cranberry sauce and pie, to area residents unable to attend to the event. By Tuesday organizers already had 145 orders for meals to be delivered.